Jeff’s opening keynote for @media was very thought provoking, as usual. 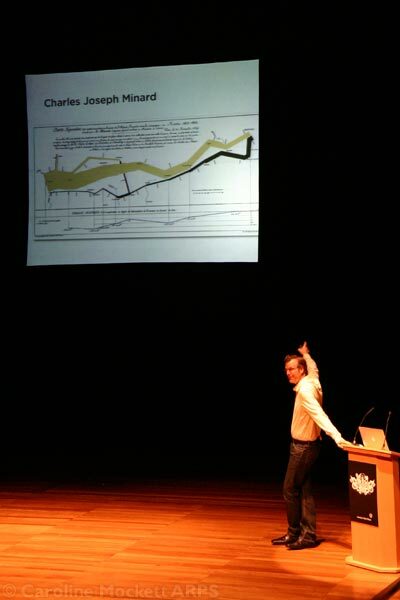 He spoke about data visualisation and how diagrams can often show us things more quickly and more intuitively than a table of data is able to. Make the data useable, you can make sense of it. Add some styles -> makes it more accessible. Example was a rainfall chart. Boring table gives no indication, you have to parse the figures and work it out. But make an icon in each cell instead – colour darker and a bigger raindrop for indicating more rainfall – suddenly the visualisation makes things easily understood. Beware, “prettification” can go too far, and destroy the underlying data. A Cholera outbreak in 1854 in London killed 500 people in one neighbourhood. He figured out with empirical evidence what was happening by plotting the death locations on a map. The local water pump was infecting people – pump handle removed -> people stopped dying. He effectively mashed up pump location vs Cholera deaths and proved Cholera was a water-born disease. Lead to the development of Victorian sewers. Found new way of gaining meaning from data. Tube map designer – Veen showed us before and after views. The old version was very confusing. Leaving out all the dross made things a lot simpler and more intuitive. Simplified things. Don’t plot too many things at once. Inspired by Indiana Jones plane journey – dot per datum on the chart. Don’t junk up things too much – remove “chart junk” and things get more comprehesible. Lots at the beginning, tails off in a log graph – compared with cost of changing your mind – the opposite. As launch approaches, expense climbs dramatically. This entry was posted in at media, books, conferences, design, inspiration, usability and tagged atmedia08, charts, data, jeff veen, london web week, lww08, maps, visualisation. Bookmark the permalink.